I know that this must have happened more than once, but for the love of Thor, what a spectacular shot this is. The Lady of the Harbor standing still against the forces of nature. 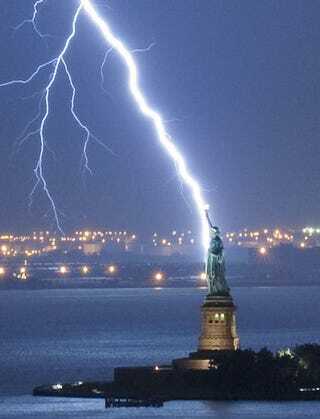 Give me your tired, your poor, your huddled masses yearning to breathe free, and 1.21 gigawatts of electricity, indeed. I was ready and waiting and took 81 shots before finally getting this one. It was pure luck really, a once in a lifetime opportunity. It's the first photograph of its kind I have ever seen.